Because the altitude is higher here than on neighboring islands, visitors should not miss Kafu Banta (Cape of Happiness), which offers a scenic view from Nuchi-Una, a salt producer located on the cape that is also a popular tourist destination on the island. 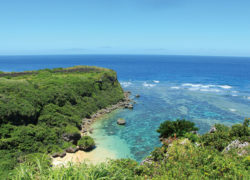 The breathtaking view of magnificent coral reefs makes this a scenic spot that’s rare even onthe main island of Okinawa. Kafu Banta offers a cliff-top view of the sea 120 meters below.